Callie is listening to the neighbor's dog. Lucky for the dog, it didn't come into my yard. It likes to stop by yard to scare the cats and do its business. I'm not a fan. Thank you for visiting my 365! Beautiful cat and a lovely capture! She's beautiful!! Great look on her face! Perfectly captured. This is a very sweet shot. I like the way you've framed the kitty. Lovely! 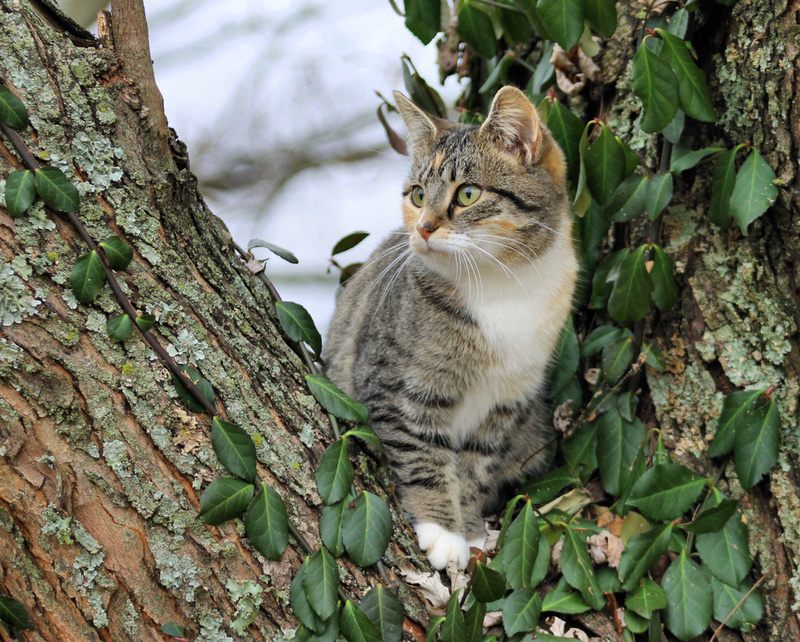 Smart cat up in the tree. So...does she scare the dogs too? We had one that chased them home. Beautifully framed shot of sweet Callie...I like the vine still fighting to be green too. @sabanford No, my cats are terrified of him. If he comes in the yard, they go up on the roof. So adorable and beautifully composed. I'm a fan of cats and I must Fav this! What a gorgeous kitty. Fave and follow....! @cjwhite ;0) Sorry you had a rough day!